Nursing is one of the most unappreciated professions in the medical field. You spend long hours on your feet all day, potentially exposing yourself to hazardous materials and chemicals. When you are a nurse with flat feet, your day usually ends with you in severe pain from shoes that do not support your feet correctly. Finding the right nursing shoe can be challenging because there are very few companies that manufacture them. We’ve done the research, finding the best nursing shoes for flat feet. With such a demanding job, you deserve a comfortable work shoe to get you through the day. Understanding the demand for quality nursing footwear, Nurse Mates manufactures a complete line of products catered to the demographics of this profession. As the only shoe specifically made for nurses on our list, the Nurse Mates Women’s Dove Shoe has a specific design for nurses who spend long hours in the hospital. Elastic goring on the sides of the stain-resistant leather upper make sliding into this shoe more convenient. This lightweight nursing shoe has a slip-resistant EVA outsole with a 1.5” heel for impact diffusion. Steel shanks in the sole provide excellent arch support and stability for those fast-paced days at work. The most important feature of the Nurse Mates Women’s Dove is their comfort. The padded collar cradles your whole ankle and a removable EVA foam insole forms to the shape of your foot. There is a mild break-in period that shouldn’t last more than a few days. These shoes run small and narrow, so you’ll need to order a size up. There have been some reports that they fall apart within a year, but these complaints were relatively minor. The Nurse Mates Women’s Dove is a moderately-priced shoe designed for nurses by nurses, making them our choice for the best nursing shoes for flat feet. 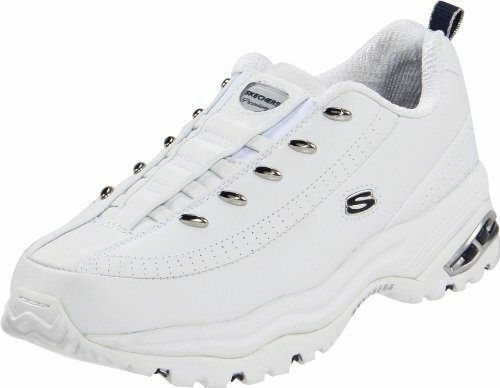 Skechers manufacturers active footwear for their customers who are always on the move. Although the Skechers Sport Women’s Loving Life Memory Foam Fashion Sneaker isn’t necessarily a “nursing” shoe, its comfort and reliability make it a favorite among nurses. The synthetic/mesh upper and a soft interior fabric lining help your feet breath throughout the day. The flexible rubber outsole is lightweight, helping with foot fatigue. These tennis shoes have bungee laces and a heel tab so that you can easily slip them on and off. The patterned outsole provides good traction for slippery conditions. The memory foam insole supports your flat feet, making them ideal for those with chronic foot, knee, and back pain. 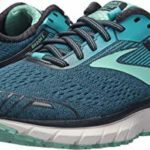 The Skechers Sport Women’s Loving Life Memory Foam Fashion Sneaker runs small and has a tight toe box, so they are best for women with narrow, flat feet. There is a mild break-in period that usually lasts a few days. Over time, the ankle can loosen, altering the fit. 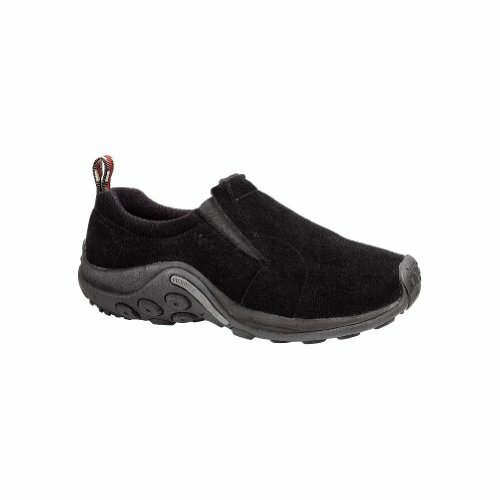 The Skechers Sport Women’s Loving Life Memory Foam Fashion Sneaker is a budget-friendly, comfortable, and fashionable work sneaker that comes in a variety of styles and colors, making it an excellent choice for nurses who work long hours. Crocs have built their reputation for designing quality shoes for several work scenarios. They are a favorite of nurses, chefs, and other professions. 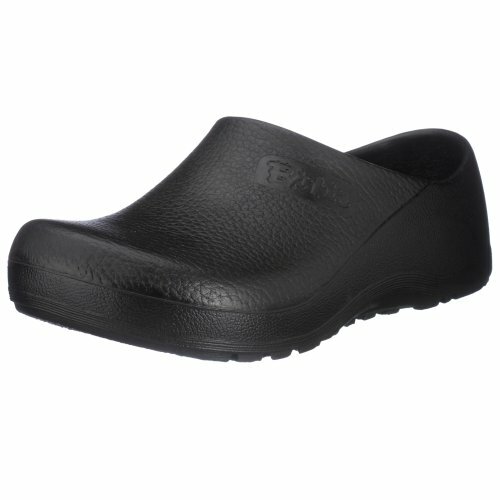 The Crocs Men’s and Women’s Bistro Clog Slip Resistant Work Shoe has an enclosed top to protect your feet from spills and other injuries. The leather upper has a thicker material around the toes for further safety. A synthetic, slip-resistant sole keeps you from sliding in wet conditions, while the 1” platform provides shock absorption. Croslite construction makes the shoe lightweight and tough enough to stand up to the hardest work conditions. Crocs are known for their comfort, and the contoured footbed reduces foot fatigue after long days. The material is easy to clean for the messiest days, and a heel strap gives you a more secure fit. Crocs run large, so you’ll have to order up from your normal shoe size. There isn’t an interior lining, and the enclosed upper doesn’t breathe that well. If you have weak ankles, these probably aren’t the shoes for you. They provide very little ankle support. However, they are a popular, budget-friendly unisex shoe ideal for nurses with flat feet. Merrill opened for business in the early 1980s, with an idea to manufacture budget-friendly hiking boots. 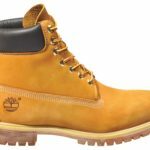 Throughout the next two decades, they would expand their footwear into casual footwear with the traction of hiking boots. A merger with Wolverine led to the design of a casual slip-on shoe with the aggressive tread of hiking footwear, which would become its signature design: the Jungle Moc. The Merrell Women’s Jungle Moc Slip-On Shoe has been on the market for over twenty years, with constant innovation to make them a casual shoe that is safe for a variety of environments. The synthetic suede upper and antimicrobial inner lining make them a comfortable shoe for all-day wear. The Jungle Moc’s real winner is the rubber sole with excellent traction that suits several work scenarios. This shoe is comfortable because of its design. With an Air Cushion heel and a nylon arch shank, the Jungle Moc has good arch support and shock absorption. They do run small, so you’ll have to order a size up. The suede upper requires a break-in period to stretch to your foot. Even after this initial phase, the suede still doesn’t breathe well. The Merrell Women’s Jungle Moc Slip-On is best for women with flat feet who have a slight arch, or they have foot or back conditions that need extra support in their footwear. If you favor the tennis shoe for your workwear, the Skechers Sport Women’s Premium Premix Slip-On Sneaker may be your perfect match. This budget-friendly athletic shoe has a leather/synthetic upper with elastic goring laces and a heel tab for a quick slip on during your busiest days. Designed for ultimate comfort, the shoe’s padded collar and tongue cradle the foot. The Premium Premix has an EVA midsole for shock absorption coupled with a 1.5” heel with air cushioning to relieve foot pain. 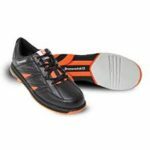 A slip-resistant rubber outsole with excellent traction finishes out the tennis shoe, making it safe in wet conditions. As comfortable as the Skechers Sport Women’s Premium Premix Slip-On Sneaker is on your feet, it does have a few design flaws. There is a mild break-in period, so they aren’t comfortable right out of the box. You’ll have to wear them a few times to break them in. Even after the leather softens, the collar remains tight around the ankle. If you like a snug fit, then this won’t be an issue for you. The shoes run small and narrow, so remember to order a size up from your regular athletic shoe size. The Skechers Sport Women’s Premium Premix Slip-On Sneaker tend to fall apart after about a year of everyday wear, but they are so cost-effective that buying another pair won’t hurt your pocketbook. Slip-on shoes are popular among nurses because they eliminate the need to tie up laces or re-tie them when they come loose. Alegria’s footwear is well-known for their supportive footbeds that include memory foam, cork, and soft polyurethane that gently cradle the foot for comfortable support, no matter how long you are wearing your shoes. 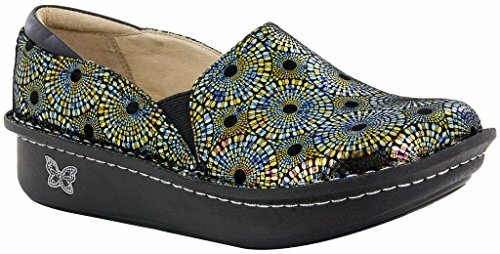 The Alegria Women’s Debra Slip-On is a moderately-priced low-top slip-on shoe that is available in many different styles and colors. Elastic goring stretch the upper for a convenient slip-on. The stain-resistant leather upper protects the top and sides of your feet from your toes to the ankle. The supportive footbed forms to the shape of your foot, providing maximum comfort. The synthetic outsole has a 1.5” heel and a 1” platform for shock absorption. The sole is slightly curved into a rocker sole, putting more spring in your step. These shoes do run large with a roomy toe box, so you may have to order a size down. The removable memory foam insole doesn’t provide that much arch support, but this isn’t that important if you have extremely flat feet. If you need more cushion, the insole slides right out for your custom orthotic. There have been a few complaints that the leather upper doesn’t breathe that well, and that the printed designs wear off with constant wear. 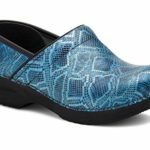 Despite these issues, the Alegria Women’s Debra Slip-On is an extremely comfortable and convenient shoe for nurses. Birkenstock is one of the oldest shoe companies in the world that is still in business today. Since 1774, the company has been creating quality footwear in Europe, eventually spreading into a global presence. One of the few shoe companies whose products are recommended by podiatrists and foot specialists, Birkenstock has introduced their trademark flexible footbed to their line of work shoes. The Birkenstock Professional Unisex Profi Birki Slip-Resistant Work Shoe is a polyurethane shoe with a synthetic, slip-resistant sole that protects against work hazards. While it is labeled unisex, the style comes in both men’s and women’s sizes to ensure the right fit. Known for their arch support, the Birkenstock footbed molds to your foot, distributing your body weight. This relieves foot pain, making the workday less irritating. A 1.5” heel absorbs impact while you walk. Birkenstocks run large, so ordering a size down is best for the best fit. There is a substantial break-in period, during which the shoe will squeak. This moderately-priced work shoe may feel bulky at first, but they are so comfortable that you won’t care. When selecting a quality nursing shoe, you should always choose a model that has proper shock absorption and cushioned insoles. Having safety features, such as slip-on capability and non-slip outsoles are also great qualities. Since you will be spending so much time on your feet, your shoes need to be comfortable. Although most hospitals have their own dress code, and they will recommend particular brands, not many of them are designed for nurses with flat feet. 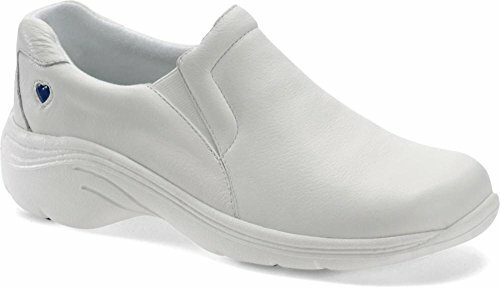 All of the options on this list will suit you well, but our choice for the best nursing shoe for nurses with flat feet is the Nurse Mates Women’s Dove Shoe. They are specifically engineered for the profession, and they are comfortable enough to wear them all day, even if you have flat feet. They have the safety features that almost all hospitals require, and they are moderately priced. The Nurse Mates are the best investment you can make, and your feet will thank you after your long shifts. 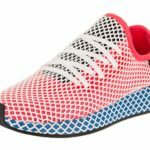 Adidas Deerupt Running Shoe Review: How good is this sneaker?